I can't resist offering a quick 'digested read' of Crime and Punishment: not of the book itself, but of the introductory essay to his new Penguin translation of Dostoevsky's novel by Oliver Ready. The three-page spread dominates today's TLS, boosted by one of Mikhail Shemiakin's surreal illustrations (also used for the new translation) on the front cover. Keen Dostoevsky watchers will be aware that this translation comes out on Feb 27th, and that there will be a formal launch in Pushkin House, London, in the same month. Alas, my current location on the Jurassic Coast - as paleontologically appropriate as it is geographically remote - prevents me from galumphing down to London for this star-studded event. 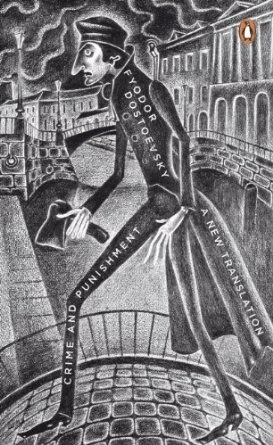 Yet Crime and Punishment is more than ever on my mind as I'm once again teaching it to undergraduates, using the David McDuff translation (Oliver's immediate predecessor at Penguin). So I devoured Oliver's TLS essay instead of dinner, most of which my dinosaur hatchling managed to steal unobserved. This is a genuinely interesting essay which manages to speak to both the academic and the general reader. It situates Crime and Punishment in its historical, political, and philosophical context as well as any previous translator's introduction, with intriguing snapshots of the elderly Tolstoy as 'aggressively teetotal' (because he ascribes Raskolnikov's mental confusion to that beer he downs with Marmeladov), of Pisarev and Chernyshevsky as hard-bitten types for whom prison was, ominously, 'more than a metaphor'. Dostoevsky managed to pastiche and plagiarize the words and slogans of the latter two in his novel: hence the contemporary perception of Raskolnikov's moral dilemma as hackneyed, even trite. Risking even greater triteness, no introduction to the novel can avoid taxonomising the murderer's motives. Oliver not only minimizes the inevitable recapitulation of these, he proposes a new condition (rather than a motive per se) which makes the murder inevitable: pathological passivity. This passivity is a state of spiritual death, and that is what enables the crime. Dostoevsky shows how a man who feels as if he is not alive and not truly capable of affecting reality will affect it for precisely that reason – and with catastrophic results. In his own estranged perception, not only is his sense of his own reality attenuated, so too is his sense of the reality of his fellow human beings, and of the boundaries between separate lives. The eerie astonishment that overcomes Raskolnikov throughout his crime is the eeriness of a dead man meeting and muffling life. To understand the source of this self-suffocation in a talented and vital young man, Oliver argues, would be to answer the true '“enigma”' of the novel. Raskolnikov is himself a textual sleuth, an inveterate literary critic. Before and after his crime he shows an uncommon analytical interest in written communications, which are shared with the reader in their entirety: a ten-page letter from his mother, a much curter missive from his sister’s odious suitor. He reads between the lines (thereby encouraging us, as readers, to do the same) and judges character by style, surprising those around him by picking on apparently trivial choices of words and phrase at moments when far weightier issues seem to be at stake. 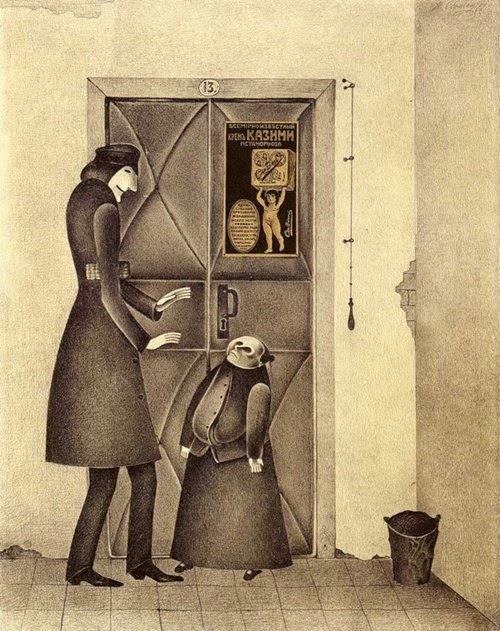 For Raskolnikov, life is a text to be understood, and even, at times, a text that has already been written. Finally, Oliver manages to throw new light on Dostoevsky, reminding us how poorly we understand his true intentions and beliefs while mentioning the access we do have through Dostoevsky's various pseudonymous commentaries in Diary of a Writer and his letters to his brother Mikhail (his 'soulmate') and others. To some extent, this opacity is the consequence of the 'strategy of ambivalence' Dostoevsky practised in both art and life. As tactfully as a Hello! photographer, Oliver allows his subject to slip away, facade intact, at the end of his essay: as the last fascicles of Crime and Punishment are bound for Russian Messenger, Dostoevsky and his new bride Anna Snitkina disappear into the sunset. Thanks for this; you've whetted my appetite not only for the TLS piece but for the Frank bio which I've barely begun.